have been treasured by humankind since the beginnings of civilization. Every ancient civilization found practical and decorative purposes for gem materials. The durability of gemstones lent itself to practical uses: ancient gemstones were carved and used as seals that acted as the bearer's signature. Egyptian scarabs are the best known of ancient seals; the Egyptian chief justice wore a lapis lazuli seal engraved with the image of the god Ma which represented "Truth". Scarabs were also said to have the power to deliver the dead into eternal life. Of course, these gemstone seals were beautiful so they were also worn as talismans to protect and bless the wearer. The crown jewels of many kingdoms were pawned to finance wars of conquest and discovery; the best known was Queen Isabella of Spain who financed Christopher Columbus in his voyages. Fortunately, today everyone can enjoy gemstones. Nature's creation of mineral crystals which are cut into gems is a miracle of complexity, the culmination of a process which takes thousands of years. Gemstones are purchased for many reasons: to add to a connoisseur's collection, as a sentimental gift, as a fashion statement or to commemorate a significant occasion. Ultimately you should choose a gemstone for its beauty. The color of the gemstone is a result of subtle differences in the chemistry of the crystal. Color is also an essential element of a gemstone's beauty; the variety of colors in gemstones is nearly infinite; every conceivable color can be found in a gemstone. Beauty is also influenced by the internal landscape of a gemstone. Gemstones may be transparent, reflecting out a fiery brilliance or they may have an internal landscape of tiny inclusions that create a mystical aura, a hovering star, an all-seeing eye. Completing the work of nature, the cut brings out the full potential of a gemstone's brilliance, scintillation, and dispersion. Carved gemstones have reached a peak of perfection today that has evolved over the last 8,000 years. Judging beauty is subjective: your preferences for color, shape, size and clarity will influence your gemstone choice. There is no single "best" gemstone, each has its own personality. To make a purchase that will give you years of satisfaction you must have the "gemstone experience"; this requires looking at many gems and getting a feeling for what is truly possible in the world of gemstones. 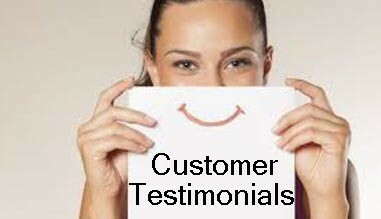 With knowledge and experience you can become a discriminating buyer. Like the ancients, we value the rarity of natural gemstone materials. Gemstones are Nature's limited edition: this makes them much more valuable than any man-made or synthetic stone that scientists can manufacture. Pricing gemstones is quite complex. Supply and demand economics govern the natural gemstone market. Factors that determine supply of gem materials include mining problems, labor problems and costs, politics, weather, as well as nature's limited supply of deposits. Of the roughly 3000 species of minerals about 200 qualify as gem materials. However, only twenty species are commonly used as gems in jewelry. Even if a gemstone is exceptionally rare it may not command a high price if there is no great demand for the material. For example, fine red spinels are far more rare than rubies, but since the stone is not well known it does not command a price any where near the price paid for rubies of comparable quality. The romance of gems greatly influences the demand for certain varieties; natural alexandrite has a legendary mystery surrounding it; it is a stone many people want in spite of the fact that few people actually see the "real thing". Prices for natural alexandrite of good quality is beyond most people's budget. Demand for a particular gem will vary from time to time. Fashion influences the gem market; historical events can create an increase on current demand. Demand for sapphires and sapphire prices went up after Prince Charles of England gave Lady Diana Spencer a sapphire and diamond engagement ring. 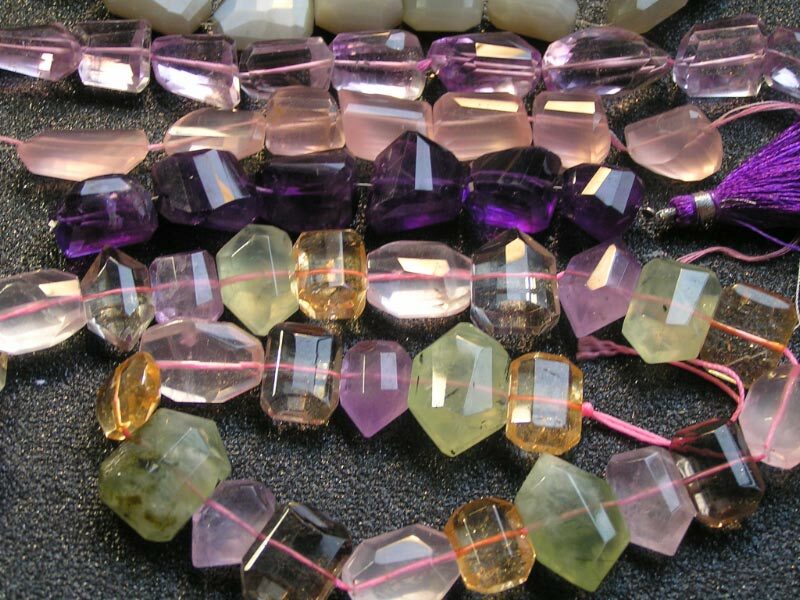 Gemstones taken as a group, vary a great deal in their durability. Some gemstones are more suitable as "collection" stones than as jewelry stones since the strain of daily wear can damage them. Some gemstones simply require more protective settings. Durability is one of the aspects that make gemstones unique. Durability is discussed in detail in this book; to assure lasting beauty, some varieties should be set in a pendant, earrings, or pin or brooches rather than in a ring, which is vulnerable to sharp blows and the wear of everyday life. A fine gemstone can be set into a piece of jewelry that becomes an heirloom for generations. There is no such thing as a used diamond. Fine natural gemstones have a store of value; while you store this value, you can enjoy the pleasure and prestige of wearing the gemstone. The greatest appreciation in value over the passage of time has traditionally been enjoyed by the finest gemstones, the best of each variety. Traditionally, the term "precious stone" referred to diamonds, rubies, emerald, sapphires, and pearls, with the term "semi-precious" referring to all other gem materials. Today the term "semi-precious" is being dropped by literate gemstone buyers and lovers. More gemstone varieties are available now than ever before. One thousand dollar per carat garnet or tourmaline does not deserve to be called "semi-precious. It is perfectly acceptable to call a mined and cut gem material; "gemstone," "colored gemstone," or even "precious gemstone." 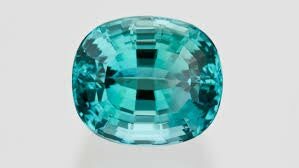 This Paraiba Tourmaline is 'worth' more than US $ 100,000, nothing semi-precious about that price tag.